As some of you remember a while back I decided to share my collection with you all. Now, I’d like to share a fellow Ringer’s collection who decided that he also wanted you all to see the passion he has for Middle-earth. I hope you all enjoy Eric’s collection and if you would like to share what you’ve gathered after years of collecting don’t be afraid to let us know. My name is Eric from Maryland, USA. I’ve always had a love for weapons growing up. 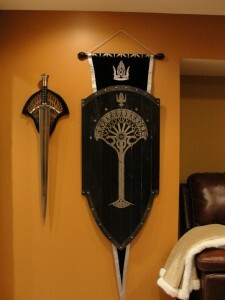 And so when United Cutlery started making the The Lord of the Rings movie swords and props, I thought it would be a cool idea to one day club our basement and make a Middle-earth themed place to hang out. I started collecting them in 2003. Most of the purchases were made between 2003 – 2006, but it was only about 6 months ago that we finally finished our basement. Until then, my collection was mostly in boxes. When collecting, it was my goal to have a poster of each main character and to have their weapon right beside that poster. In the TV room, we have the “fellowship” section. It showcases the characters at the core of the fellowship, with whatever memorabilia I could collect to represent them. In the gaming section of the basement, I have some of the original theatrical posters as well as an Elven Warrior, Rohan and Sauron sections. Some sections are still a work in progress and I have some room to hopefully grow the collection a little over the next two years. After seeing Elessar’s collection, ( which we really enjoyed viewing ), he invited me to share our collection. I thought it would be a good idea to share how we have celebrated Middle-earth. I hope you enjoy what we’ve done.